The bright and sunny days, the irresistible sea water and the insular heat, make July the ideal month for long bathing in the sea. And most of the tourists do this all the time: beach, sun and sea. I find it hard to blame them, also because if you want to go on excursion, leave early in the morning and make sure that most of the path is in the shade! Rare are the cloudy days and even more improbable the rainy ones, in all cases I have never seen a downpour lasting more than one hour in July. Despite all these good reasons to discourage any other activity that is not under the beach umbrella or in the veranda, the island of Elba comes alive in July with important initiatives and an excellent artistic level, in short, next to the unfailing festivals of boiled octopus and sardinata (grilled sardines), you can also enjoy quality shows. Opera, dance, open-air concerts at the Ginevro Mine. An amphitheater dug in the ancient rock of Monte Calamita where, up to a few decades ago, magnetite (an iron oxide that gives the name to the whole south-eastern promontory of the island) was extracted. Delimited by rocky walls higher than thirty meters, the stage is itself a spectacle, beyond the natural mix of scents of resinous Mediterranean essences and the sea breeze. Paying a ticket of modest price for the level of the shows, you can assure more than one really exciting evening during the whole month of July; I suggest you book tickets online, because even if young, the festival is already well attended and places are limited. Besides art, in the same mining yard transformed into an artistic arena, there is the possibility to dine at an outdoor restaurant that I personally have not tested yet, but which they tell me to be of a good standard. 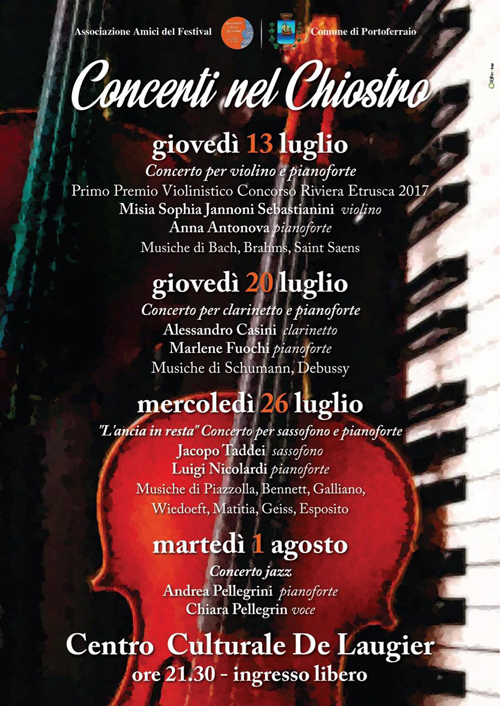 So combined with the Magnetic Festival, still during the month of July, you can also attend the music matinées and evening concerts in Piazza Matteotti in Capoliveri; these are maybe more popular events, but still of an excellent level. I was pleased to know that the cultural association of Capoliveri is the one who manages the festival, formed by sincere enthusiasts, got the management until 2022! A nice idea by the organizers of Marciana Marina: to get involved in one of the most important literary prizes in Italy and fifteen days before the nomination of the winner in Pontremoli, letting the six finalists participate in a public meeting in the town’s landmark square. Considering that in the past, among the winners of the Bancarella award, there were writers of the caliber of Hemingway, Eco, Fallaci, Connelly, Follet and Grisham, this initiative is among the most prestigious of the summer of Elba. An extraordinary resourcefulness of the organizers as well as a non-indifferent personal commitment. In fact, the same people, now assisted by the Municipal Administration and the Pro Loco, are the same who have set up two other cultural events of not less value. The Prize La Tore, attributed to important names of the journalism, literature and Italian culture, will take place on 21 July in Piazza della Chiesa (Church Square). This year (2018) prof. Philippe Daverio will reward. In previous editions have been awarded, among others, Giorgio Faletti, Andrea Camilleri, Andrea Vitali. The Prize Strega – Elba Edition, (August 4), consists of presenting – after about a month from his proclamation at the National Etruscan Museum of Villa Giulia in Rome – the winner of the Prize Strega to the Elban public. It will then be the usual Church Square that will host the winner of a celebratory evening, as it always was until 2011, when Edoardo Nesi won: after six years, Marciana Marina takes back the tradition. The cloister is that of a sixteenth century palace in Portoferraio, in which there is also the cinema hall of the city and the art gallery. In front of the “Caserma De Laugier” (so is called today the palace of the nineteenth century) there is one, in my opinion, of the simplest and yet most beautiful squares of the island, tiled with pink limestone. The visit of the square is worth by itslef, but the small cloister is also lovely and the music you will hear is of a really high level. If you like good music, whatever it is, the beauty of the place and the skill of the musicians who perform there, everything will remain imprinted in your memory as a breath of fresh air. The atmosphere is intimate, you will meet there mainly residents (of Portoferraio) and few tourists, because Portoferraio holds a record on the island: it´s the capital, the only real city on Elba and the most extensive and important urban center, but in the mind of most tourists this is lived as a place of passage, so the fashionable life of the island, during the summer, moves to smaller centres that although having much less, or perhaps because of this, they know either how to better organize events or advertise. Where: Museums, parks and archaeological areas of Elba Island. Organizer: Tuscany region, municipality of Portoferraio. Even if you belong to this category of people who lose patience after a quarter of an hour in the museum, do not worry: these visits to museums and archaeological sites on the island certainly will not be boring. The guides and entertainers are very knowledgeable and communicative and each time they invent all sorts of tricks to catch the attention of the younger ones. Although the program changes every year, there are always evening tours to Elba’s main museums, activities for children related to art and archeology, tastings … in short, the program is large and offers something for all tastes. Many events are free, but even if there are tickets to pay, the amount is often quite ridiculous and can be up to 10/12 Euros if you stop at the Gustaticium (i.e. the appetizer of the banquet in the ancient Rome), in the picturesque setting of the Roman villa delle Grotte, middle of the Gulf of Portoferraio.